righteousness: conformity to all God commands; God’s uprightness to which man is expected to conform. Jesus taught us to strive, with earnestness and as most importantly, for the coming of the Messiah (Jesus) and his reign. And seek to be able to conform to all of God’s commands. When we can do these things, all of the things Jesus had been teaching them (heavenly treasures, provisions here on earth, etc.) would be added. Summary: We have learned that God’s people rejected Him as their king. They wanted a man. So, God gave them a man, Saul, and he failed miserably as a godly king. But God chose a man “after his own heart,” David. He was a good king, and God made him a promise. Because David wanted to do good for God to build God a house, God would build David a house, one that would last forever. Today, we will see in whom that promise was fulfilled, Jesus. David believed God’s promise, and it was recorded in the Bible for us to read today. All through the ages, men watched and waited for that “Promised One” to come. Even the wise men of the Far East sought a new king that was born, and wanted to come and worship him. We find John the Baptist proclaimed He had come, and He was God’s Son. But even more than that, Jesus himself declared principles of His kingdom we must learn to adhere to. Emphasis: Our job, today, is to seek God as most important in our lives, obeying His commands, making him our King that we will serve. When we do that, we have nothing to worry about because He will take care of us. One idea for today’s lesson: (See picture below). 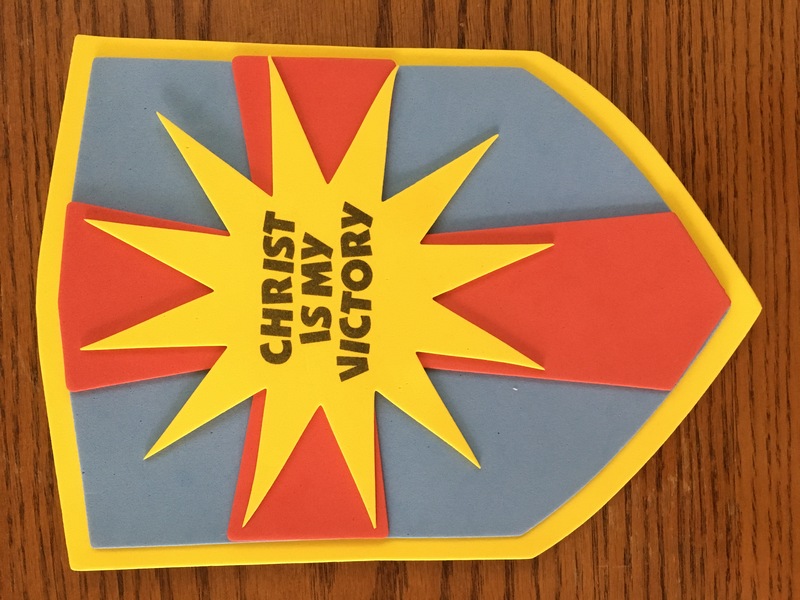 For today’s lesson I had a kit that made a shield (since we had been studying the kings of Israel) with a sicker for the middle that said “Christ is my Victory.” It seemed to fit pretty well since we had been talking about the kings of Israel. 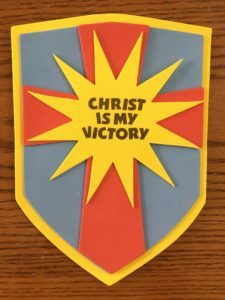 In today’s lesson we remembered the promise to King David that that Jesus was the promised King of Kings who would come. We also learned a little of Jesus’ teachings about the kingdom that would come.